The first type out of the new series of Liebherr harbour mobile cranes for panamax-sized container vessels. Built as multi-purpose crane, the LHM was especially designed for effective container handling with fully automatic container spreaders up to panamax-sized vessels. Heavy lifts of up to104 tons will be handled safely and quickly. Handling of general cargoes, pallets, steel and forest products, as well as any type of bulk commodities using a motor-grab or in 4-rope configuration with a mechanical grab for quick and efficient operation. The crane is equipped with the new undercarriage design system and contains the advantages of the reliable LIEBHERR hydrostatic drive system controlled by the LIEBHERR LITRONIC crane control system. 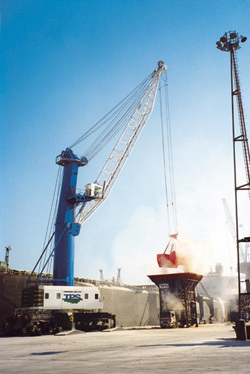 The LHM 400 Litronic performs as the bestseller among the panamax-sized harbour mobile cranes. 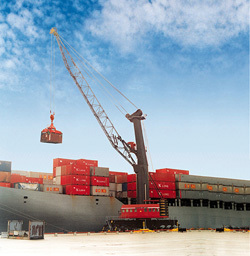 Built as multi-purpose crane, the LHM was especially designed for effective container handling with fully automatic container spreaders up to panamax-sized vessels, up to 13 boxes across. Heavy lifts up to104 tons will be handled safely and fast. General cargoes, pallets, steel and forest products as well as any type of bulk commodities can be handled with a motor-grab or in 4-rope configuration with a mechanical grab quickly and efficiently. The crane is equipped with the new undercarriage design system and contains the advantages of the reliable LIEBHERR hydrostatic drive system controlled by the LIEBHERR LITRONIC crane control system.